2Institute of Tropical Aquaculture, Universiti Malaysia Terengganu, 21030 Kuala Terengganu, Terengganu, Malaysia. Histopathological changes in gills of Oreochromis sp. exposed for 96 hr with three different concentrations of clove oil, 48 mg/L, 65 mg/L and 81 mg/L were examined in this study. These concentrations were selected by 25% lower and 25% higher than LC50 value (65 mg/L). The gills were fixed in 10% FAA (formalin acetic acid) for histological observation. Severe lesions such as lamella fusion, telangiectasis and oedema were observed at 48 mg/L. At the concentration of 65 mg/L the gills exhibited the occurrence of oedema and necrosis whereas at 81 mg/L, lifting of lamella epithelium and necrosis were noticeable. Aquaculture is the main source to help in fish supply. The aquaculture fish production has been increased over the past few decades which has led to intensive fish culture practices and stressor during handling are the common problem. The use of anesthetics for fishes is widespread in handling of fish during grading, transportation, surgery and other procedures. There were list of anesthetics used for fishes and clove oil is safe to the environment and human health. Besides, clove oil is inexpensive and more potent than other anaesthetics used in fish (Ross, L.G., 2008). Clove oil is a popular anaesthetic in aquaculture but the effect of the clove oil in different concentrations used were lack of information. To date, clove oil in low concentrations also use for sedative in aquaculture procedures such as handling and transportation. However, the histology changes of the gills were not much described. Thus, this study was evaluated the effect of clove on the histology of gills with the different concentration (Ajani, F., 2008). Healthy Oreochromis sp. or tilapia with 7-8 cm total length (TL) and 5-8 g of body weight (BW) were purchased and acclimatized for two weeks under laboratory condition while being fed twice daily with commercial fish feed. The fish were kept in aerated tank containing freshwater and the water was changed every alternate day. Feeding was stopped during 96 h experimental period (Adeyemo, 2005). Aeration was provided throughout the study. Before start the experiment, the suitable numbers of healthy fish were transferred into new tank which were continuously aerated. To determine the median lethal concentration of clove oil for 96 hr, different concentrations of clove oil concentration were as follows; 9, 16, 28, 50, 66 and 90mg/L were prepared by the appropriate diluting method of clove oil with 20L of water in two replicates. The clove oil concentrations were prepared by dissolved in 95% ethanol at a ratio of 1:10 (Cho, 2000). Ten fish were introduced into each concentration and observed for 96 hr. The mortality/survival of fish was recorded at 2, 6, 12, 24, 48, 72 and 96 hr. The dead fish were removed from the water in time to ovoid the deterioration of the water quality. The concentration at which 50% mortality of fish occurred after 96 hr was calculated by a Spearman Karber programmer. The LC50 for clove oil was 65.06 mg/L. (Coyle, S.D., 2004). For the histological changes caused by different clove oil concentrations which is at LC50 value, 25% lower and 25% higher than LC50 value were as follows; 65, 48 and 81 mg/L respectively for 96 hr. All the dead fish during this experiment were observed and gills were taken if the fish freshly dead (Taylor, 1999). At the end of experiment (96 hr), all the fish were killed and immediately removed the gills and fixed in formalin acetic acid (FAA) solution for at least 24 hr. Then, the samples were prepared by using standard method for histological technique (Feist, K.W., 2004). The tissue were sectioned at 5 μm thick and stained with hematoxyline and eosin (H & E). The tissue slides were observed under light microscope at lower to higher magnifications. The 96 hr LC50 of clove oil was determined to be 65.07 mg/L. The gill of the control fish was normal while at different concentration showed more severe of changes with increased the concentration. The description of gill histological changes showed in Table 1. Both concentration 48 mg/L and 65 mg/L showed oedema but at 65 mg/L the gill showed necrosis (Figures 1-3). The most severe histology changes showed at higher concentration, 81 mg/L. Figure 1: Gill structure of Tilapia, Oreochromis sp. exposed directly to 48.80 mg/L (lower concentration) clove oil showed oedema (thin arrow) after exposure 96 hours. (H & E stain, x40 objectives). Figure 2: Gill structure of Tilapia, Oreochromis sp. exposed directly to 48.80 mg/L (lower concentration) clove oil showed telangiectasis after exposure 96 hours. (H & E stain, x40 objectives).. Figure 3: Gill structure of Tilapia, Oreochromis sp. exposed directly to (A) 65.07 mg/L clove oil (LC50 value) showed necrosis appearance (thin arrow) while in (B) 81.33 mg/L (high concentration) showed necrosis (thick arrow) and lifting of lamellar epithelium (arrow head) after exposure 96 hours. (H & E stain, x40 objectives). Table 1: The Histopathological Responses of Oreochromis sp. 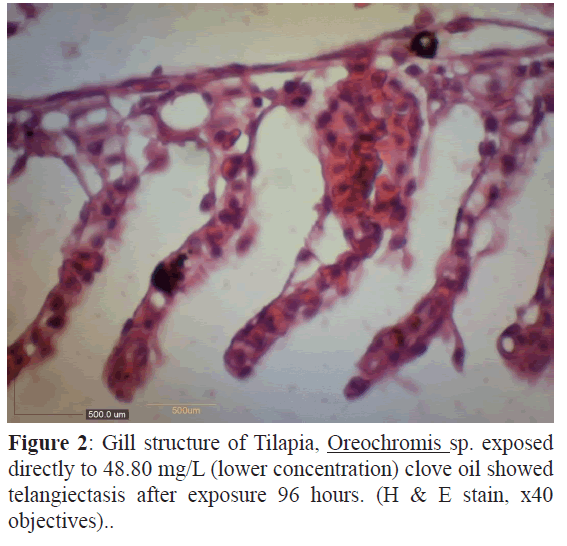 In present study is about elucidated acute toxicity effects of clove oil on histopathology of freshwater fish, Oreochromis sp. As evident from the results of the present study, the water quality parameters remained within the normal ranges among the different treatments and different experimental trials. Referred to (APHA, 1998). Fluctuation in temperature should not exceed 4°C and similarly oxygen content must not fall below 4 mg/L. In the present study, fluctuations in temperature were minute (range 27- 29°C) and dissolved oxygen was within the normal range that is 5-6 mg/L. In the present study the 96 hr LC50 value of clove oil was found to be 65.07 mg/L. Comparison with previous study which reported the acute toxicity effects of clove oil on two aquariums fish species Danio rerio (the mean 96 hr LC50 was 18.2 ± 5.52 mg/L) and Poecilia reticulate (the mean 96 hr LC50 was 21.7 ± 0.8 mg/L) (Dolezelova et al., 2011). Grush et al. (2004) studied the anaesthetic effects and acute toxicity of clove oil in one-month old zebra fish. The 96 hr LC50 obtained in this study was 21 mg/L, which is comparable to the result, obtained in Oreochromis sp. A comparable sensitivity to clove oil was reported by (Velíšek, J., 2005a) in common carp (Cyprinus carpio) with an 96 hr LC50 value of 18.1 mg/L and in European catfish (Silurus glanis L.) with an 96 hr LC50 value of 18.4 mg/L (Velíšek et al. 2006). On the other hand, a lower lethal concentration 96 hr LC50 of 14.1 mg/L was reported in rainbow trout (Oncorhynchus mykiss) by the same author (Velíšek et al. 2005b). Keene et al. (1998) obtained a similar result in rainbow trout considering that the estimated 96 hr LC50 for eugenol (active form of clove oil) was found to be approximately 10 mg/L. According to these findings, rainbow trout showed the highest sensitivity to clove oil, which corresponds with the commonly known fact that salmonids are more sensitive to environmental pollutants than other fish species. Zebra fish, carp, catfish and guppy showed comparable tolerance to acute toxicity of clove oil and Oreochromis sp. had higher tolerance acute toxicity of clove oil between all the fish species above. (Javahery, S., 2012). Oreochromis sp. was one of the first fish species cultured. This species are more tolerant than most commonly farmed freshwater fish to salinity, high water temperature, low dissolved oxygen and high ammonia concentrations (Thomas, P., 1999). Hence, the hardy characteristics of Oreochromis sp. were obtained the higher tolerance acute toxicity of clove oil compare to other species. Recently, the use of clove oil as a fish anaesthetic had gained popular. One of the criteria that proper anaesthetic in fish is must meet it safety at treatment concentration (Marking, L.L., 1985). The recommended treatment concentrations vary according to fish species, fish size, exposure time, bath quality and temperature. (Roubach, R., 2005) found that exposure of tambaqui (Colossoma macropomum) to 65 mg/L of eugenol was sufficient to induce an anaesthetic state, and recovery time was similar for dosages up to 100 mg/L. Exposure to 65 mg/L for up to 30 min did not cause fish mortality. There was no mortality in tambaqui at doses of 135 mg/L (exposure duration was not reported). The importance of the gills in respiration mechanism and ionic regulation of fish had encouraged many investigations of the effects caused to this organ by changes in environmental factors (De La Torre, 2005) (Nigro et al., 2006). 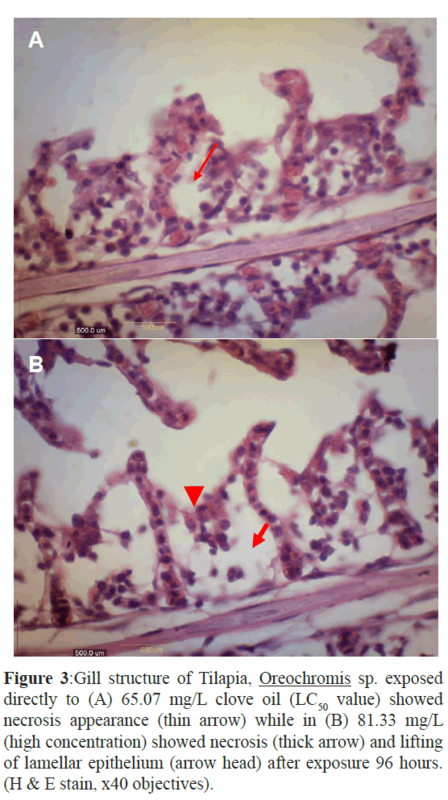 Histopathological changes were observed in gill tissue of Oreochromis sp. which had three different concentrations of clove oil, 48.80 mg/L, 65.07 mg/L and 81.33 mg/L. The concentration at 48.80 mg/L of clove oil showed alterations tissues such as oedema and telangiectasis appearance. Figure1 showed oedema alteration at the gill treated tissue. Oedema was very common gill changes in all studied species and can be interpreted as defence responses to toxic agents, as described by (Heath, AG., 1995) Furthermore, figure 2 showed telangiectasis alteration at the same gill. In these figure, oedema and telangiectasis were observed in the gill after 96 hr exposure to lower concentration of clove oil (Keene J.L., 1998). At the value of LC50 (65.07 mg/L), the figure 3 (A) showed necrosis changes at the gill exposure in clove oil after 96 hr. 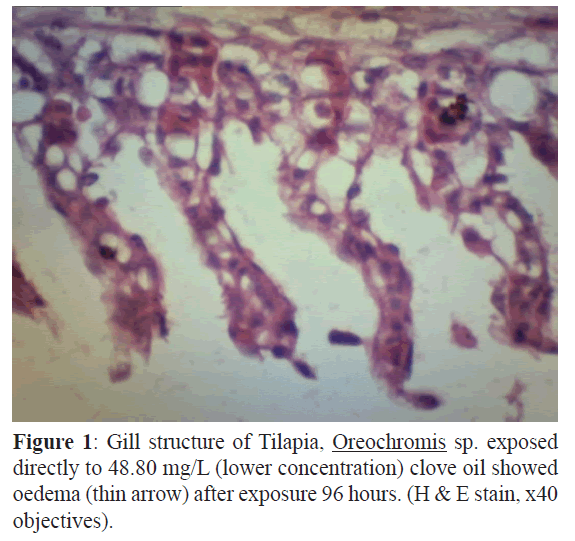 The higher concentration of clove oil at 81.33 mg/L showed necrosis appearance and lifting of lamella epithelium in figure 3 (B). Most common changes like hyperplasia, desquamation and necrosis of epithelium, epithelial lifting, oedema, lamellar fusion, collapsed secondary lamellae and curling of secondary lamellae had been reported by (Velmurugan, B., 2007) and (Jiraungkoorskul et al., 2003) in Cirrhinus mrigala and Oreochromis niloticus exposed to pesticide and herbicide. These previous study supported the observation at the LC50 value and higher concentration of clove oil on the necrosis changes in figure 3 (A) and (B) respectively (Wagner, G.N., 2003). Telangiectasis was observed in ammonia exposed Nile tilapia (Benli, A.C., 2008) and telangiectasis also the first events in inflammation cascades and it was the first lesion showed in Colossoma macropomum gill at paraquat in 29°C (Salazar-Lugo et al., 2011). All these previous study proved the appearance of telangiectasis at gill of Oreochromis sp. in figure 2. The severe lesions in gill were observed in fish exposed to high concentration at 81.33 mg/L were necrosis and lamella fusion. According to (Mallat, J., 1985). The most common gill lesions which induced by toxic substances and other chemicals were necrosis, hyperplasia and lamella fusion. The degenerations of gills also cause a dysfunction of fish gas exchange ability causing an anoxic internal behavior (Ajani, F., 2008). This was showed by histopathological observations when the fish was exposed at 81.33 mg/L clove oil exhibited a severe lesions on the gill such as necrosis and lifting lamella epithelium. These proved that the fish was approaching their tolerate limits and developed osmoregulatory failure (Lawson, E.O., 2011). Histopathological changes in fish tissue and residue levels of test substances in fish are very important parameter for deriving the maximum acceptable concentration of chemicals in the context of fish culture requirements (Svobodova, Z., 1994). We would like to extend our thanks to Institute of Tropical Aquaculture / AKUATROP laboratory and hatchery management for the support. Thanks to Pn Wahidah for her help in laboratory during this study. This is a part of a Master project undertaken by Zahidah at University Malaysia Terengganu. APHA.(1998). Standard Method for Examination of Wastewater and Water (20thedition) Washington D.C.). Pages 8010 A.
Benli, A.C., Köksal, G., Ozkul, A., (2008). Sublethal ammonia exposure of Nile tilapia (Oreochromis niloticus L.) kidney histology. Chemosphere 72 (9):1355–1358.Coyle, S.D., ., (2004). Durborow, R. M., Tidwell J. HCoyle, S.D., ., (2004). Anaesthetics in Aquaculture.Southern Regional Aquaculture Center.SRAC Publication No. 3900. Cho, G.K., Heath, D.D., (2000). Comparison of tricainemethanesulphonate (MS-222) and clove oil anaesthesia effects on the physiology of juvenile Chinook salmon Oncorhynchus tshawytscha (Walbaum). Aquaculture Research.31:537-546. De La Torre, F. R., Ferrari, L., Salibia´n. A., (2005). Biomarkers of a native fish species (Cnesterodon decemmaculatus) application to the water toxicity assessment of a peri-urban polluted river of Argentina. Chemosphere.59:577- 583. Dolezelova, P., Macova, S., Plhalova, L., Pistekova, V., Svobodova, Z., (2011). The acute toxicity of clove oil to fish Daniorerio and Poecilia reticulate. University of Veterinary and Pharmaceutical Sciences Brno, Czech Republic. 80:305-308. Feist, S.W., Lang, T., Stentiford, G.D., Köhler, A., (2004). Biological Effects of Contaminants: Use of Liver Pathology of the European FlatÃ¯Â¬Âsh Dab (Limanda limanda L.) and Flounder (Platichthys ?esus L.) for Monitoring. In: ICES Techniques in Marine Environmental Sciences No. 38. ICES, Copenhagen. Grush, J., Noakes, D.L.G., Moccia, R.D., (2004).The efficacy of clove oil as an anesthetic for the zebra fish, Daniorerio (Hamilton), Zebra fish. 1:46-53. Heath, A.G., (1995). Water Pollution and Fish Physiology.Boca Raton.Press/Lewis Publisher. 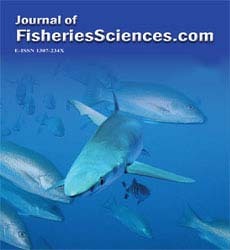 Javahery, S., Nekoubin, H., (2012).Effect of anaesthesia with clove oil in fish (review).Fish Physiology Biochemical.DOI 10.1007/s10695-012-9682-5. Jiraungkoorskul, W., Upatham, E.S., Kruatrachue, M., Sahaphong, S., Vichasri-Grams, S., Pokethiyiyook, P., (2003). Biochemical and histopathological effects of glyphosate herbicide on Nile tilapia (Oreochromis niloticus), EnvironmentalToxicology.18:260- 267. Lawson, E.O., Anetekhai, M.A., (2011). Salinity tolerance and preference of hatchery reared nile tilapia, Oreochromisniloticus(Linnaeus 1758). Asian Journal of Agriculture Sciences.3(2):104-110. Keene J.L., Noakes D.L.G.,Moccia R.D., Soto C.G., (1998). The efficacy of clove oil as an anaesthetic for rainbow trout, Oncorhynchus mykiss (Walbaum).Aquaculture Research. 29: 89-101. Mallat.J., (1985). Fish gill structural changes induced by toxicants and other irritants: a statistical review. Canada Journal of Fish Aquaculture Science.42:630-648. Marking, L.L., Meyer, F.P., (1985). Are better anaesthetics needed in fisheries? Fisheries.10:2-5. Nigro, M., A. Falleni, I. Del Barga, V. Scarcelli, P. Lucchesi, F.Regoli., G. Frenzilli. (2006). Cellular biomarkers for monitoring estuarine environments: transplanted versus native mussels. Aquatic Toxicology.77:339-347. Ross, L.G., Ross, B., (2008). Anaesthetic and Sedative Techniques for Aquatic Animals, 3rdedn. Blackwell Publishing, UK. 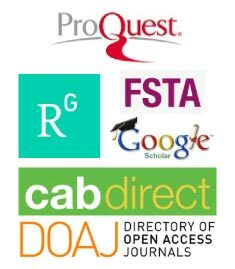 Roubach, R. Gomes, L.C., Fonseca, F.A.L., (2005). Eugenol as an efficacious anaesthetic for tambaqui, Colossoma macropomum (Cuvier).AquacultureResearch.36:1056-1061. Salazar-Lugo, R., Mata, C., Oliveros, A., Rojas, L.M., Lemus, M., Rojas-Villarroel, E., (2011). Histopathological changes in gill, liver and kidney of neotropical fish Colossomamacropomum exposed to paraquat at different temperatures. Environmental Toxicology Pharmacology.31(3):490-495. Svobodova Z, Vykusova B, Machova J., (1994) The Effects of Pollutants on Selected Hematological and Biochemical Parameters in Fish. In: Sublethal and Chronic Effects of Pollutants on Freshwater Fish, Muller R, Lloyd R (Eds.). Fishing News Books 39-52, UN. Thomas, P., Michael, M., (1999). Tilapia Life History and Biology.Southern Regional Aquaculture Centre. No:283. Velisek J., Svobodova, Z., Piackova, V., (2005a). Effects of clove oil anaesthesia on common carp (Cyprinuscarpio L.). Veterinarni Medicina-Czech. 50:269-275. Velíšek, J. Svobodová, Z., Pia?ková, V., (2005b). Effect of clove oil anaesthesia on rainbow trout (Oncorhynchus mykiss).ActaVeterinaria Brno.74:139-146. Velíšek, J., Wlasow, T., Gomulka, P., Svobodová, Z., Novotný, L., Ziomek, E., (2006).Effects of clove oil anaesthesia on european catfish (Silurusglanis L.). ActaVeterinaria Brno.75:99-106. Velmurugan, B., Selvanayagam, M., Cengiz, E.I., Unlu, B., (2007).Histopathology of lambda-cyhalothrin on tissues (gill, kidney, liver and intestine) of Cirrhinusmrigala. Environmental Toxicology and Pharmacology.24:286-291. Wagner, G.N., Singer, T.D., McKinley, R. S., (2003). The ability of clove oil and MS-222 to minimize handling stress in rainbow trout (Oncorhynchus mykiss Walbauman). Aquaculture Research. 34:1139-1146.